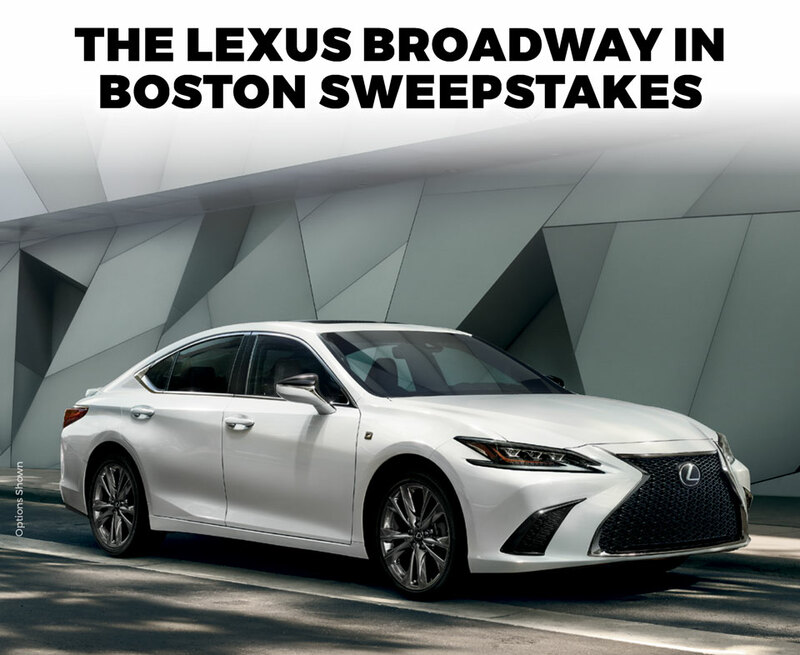 A two (2) year lease to a new 2019 Lexus ES F Sport Vehicle and a Season Subscription for two (2) to the Lexus Broadway In Boston 2020/2021 Season. A weekend getaway to New York City, including two (2) roundtrip air tickets from Boston Logan International Airport to a New York City area airport, a one (1) night, double occupancy stay in a to be determined Manhattan hotel, one dinner voucher for two (2) persons at a New York restaurant as determined by Sponsor, two (2) tickets to a Broadway show in Manhattan, and a four-show season subscription for two (2) persons to the Lexus Broadway In Boston 2020/2021 Season. The depiction of the Grand Prize Vehicle in any advertising promotional materials or physical display may not reflect the actual vehicle delivered to Grand Prize Winner. ES F SPORT VEHICLE shown with options. © Lexus 2019.